Have you ever seen Rachael Ray's Garbage Bowls? I have and at first I thought it was a stupid idea, then, I got a dishwasher. I hated having to wash dishes by hand so why would I use a garbage bowl when I could just use my garbage can? I recently came across Zak Designs and found out they have their own Confetti bowls that would be perfect for any occasion or function! 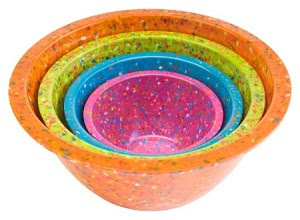 What I love most about the Confetti Bowls is the fact that they are BPA, Lead and Phthalate free!!! How great is that? They are also made out of 100% recycled melamine! What I love about Zak Designs as a company: As a global leader in mealtime products, Zak Designs is dedicated to being a leading company in its commitment to protecting the environment. We have taken many steps as a company to ensure that our business goes above and beyond environmental regulations set by local, state and federal agencies. We are committed to helping improve the environment not only through the products and packaging alternatives we develop, but through our participation in programs and promotions that benefit everyone we share the planet with. Because we believe that it's often the smallest steps that lead to the biggest accomplishments, Zak makes environmental commitments at every level every day. From programmable thermostats that lower the temperatures to conserve energy during off-hours to roof coating upgrades that reflect heat to using propane powered forklifts and manual hand jacks in our warehouse, Zak makes every effort to be as energy conscious as possible. We have also established a recycling program at our office that goes way beyond aluminum cans in the breakroom. Countless cardboard boxes come through our warehouse and are either put back into use for other products or recycled. We also have recycling programs for batteries, engine oil, unserviceable pallets, paper, and even office supplies. If Zak Designs is Green through and through and I am happy to be a repeat customer because I am not only impressed with their amazing bowls but also with their green initiatives. Way to Go Zak! for getting the DSSM seal of approval! i like these bowls. i normally prefer vintage bowls that remind me of the old days but i would be very happy with these. Those are the cutest bowls! Perfect party bowls! I love those confetti bowls. So fun and unique!! !